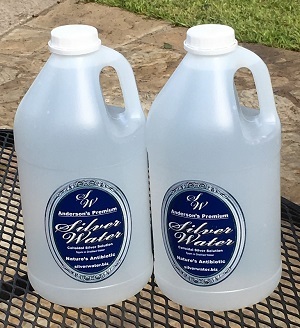 SILVER WATER is effective for chronic (long standing) problems, acute (recently started), first aid (wounds or burns), immune support, animals, plants, and sanitation of all sorts. It is very effective for all types of eye infections, pink eye, and injuries to the eyes, extremely effective for sinus and ear infections. For ACUTE PROBLEMS, something that has recently started such as an infection, influenza, a cold, a virus, or food poisoning, start by drinking 2oz of Silver Water then repeat a second time 45 minutes later. Do this three times the first day, twice the second day, then once the third day. Often, three days is sufficient to relieve acute symptoms of sickness, and help promote healing of wounds or burns on the skin. Some people who have fever may choose to take a tablespoon every hour after the initial 2oz. For FOOD POSIONING, drink 2oz of Silver Water then repeat a second time 45 minutes later. This is usually sufficient for recovery. This second dose is crucially important for a 100% kill rate of bacterial, pathogens or viruses in your body. Silver’s kill rate of pathogens levels off at about 90% after 0.7 Hours, or 42 minutes. The kill will only reach about 95% after 2 Hours. A 100% kill rate will be achieved at about 1.1 Hours taking two doses 45 minutes apart. For CHRONIC PROBLEMS, something that has continued for over 4 months, begin by following the acute infection protocol. Then continue to drink just one dose of 2ozs, 3x a day for at least a week. Then you begin to take 2-4 ounce a day until satisfied. Chronic skin problems will require both spraying with Silver Water and ingesting it. Most skin problems are related to allergies. Changing soaps, launder detergents, deodorants, and shampoos can help. Please note to resolve most chronic problems, it must be treated four months for every year you have had the problem, no matter what product or treatment you are using. This principle is true for all types of healing, including emotional difficulty. Consider how long you have had the problem to determine how long it will take to remedy it. For FIRST AID USE spray full strength on cuts, scrapes, infection, acne, yeast infected areas, burns or sunburn. You may soak a cotton pad or bandage in Silver Water then place it on injured area. I usually spray or pour on an injured area before bandaging. It is best to use a spray for acne, warts or bug bites. Soaking toes in Silver Water helps remove toe fungus. As an IMMUNE SUPPORT, drink 1-2ozs daily to increase your immune system. Hold the Silver Water in the mouth for about a minute then slowly swallow it. Doing this for a few weeks, even if you feel healthy, will provide a secondary immune system to combat exposure to viruses, molds, and bacteria. Work your way down to just a tablespoon a day. When you have built up your immune system sufficiently, you may feel no need to take the Silver Water for a few days. That is your body’s way of telling you your immune system is at its optimum. Our body will always assist us with our health if we listen to it. Silver Water is effective for large and small animals. Elderly and sickly animals should have 2oz as a dietary supplement in their water. If ill, give two, doses, 45 minutes apart, 1oz for small animals, 2oz for large animal, and 4oz for horses. Keep Silver Water added to their water. Spray Silver Water full strength on cuts, wounds, and around bedding as needed. Spray product directly on animals for itching skin problems and into the eyes. For SANITATION, add 2oz per gallon to questionable drinking water to purify it. Spray full strength on air ducts, counter tops, garbage pails, cutting boards, and mold growing areas. For USE ON FOOD, clean vegetables, fruits, and meat by spraying them, killing bacteria and parasites, before AND after rinsing them then putting them in the refrigerator. Spraying food or adding one ounce to juices or milk will help them stay fresh longer. For PLANTS, Add 1oz per gallon to their water for robust plants and to combat root problems. Spray foliage infested with mold or fungus.